The stock Corvette headlights didn't seem very bright when driving on dark roads at night. The stock wattage was 60/55 for low/high beam. I tried several brands of "bright white" and "cool blue" bulbs, but I still wanted more. I then found out that the stock plastic headlamp lens casings and stock wiring were not sufficient for installing the higher wattage bulbs. It was time for an upgrade. In order to use the higher wattage bulbs (90/100watt in this case) it is necessary to rewire with relays and larger wire to handle the additional load. The stock headlamps were also replaced by the e-code versions. This is the Export RH side of the road versions. These headlights not only are built to withstand the heat of the higher wattage bulbs, but also place the light in a better place down the road instead of scattering the beam all over the place. The upgrade was well worth it. 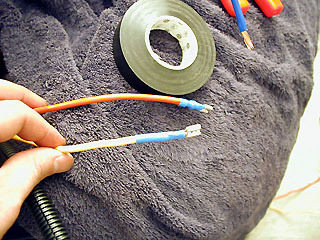 Use electrical tape and/or heat shrink tubing to seal the wire ends from water and debris. 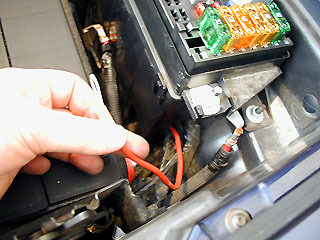 Disconnect the battery after raising your headlamp doors - the battery drains fast with the parking lights on!!! Connect ground wires first and power wires last. Protect your painted surfaces with something such as a soft towel to avoid chips and scratches. Printout the instructions / diagram and read through them before starting to make sure you have everything you need. If you decide to use heat shrink on the connections (like I did) and figure out that you don't have a heat gun to shrink the stuff then I have a suggestion. Get some aluminum foil and a lighter. Get the heat shrink placed where you want it and wrap the aluminum foil around it. Heat with the lighter for about 5-10 seconds while rotating. It works better than a heat gun!!! 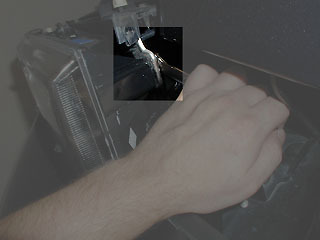 Remove the 3 screws which hold the black plastic bezel. Carefully remove the bezel by pulling the top first. 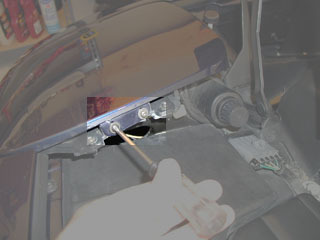 Remove the headlight door cover by using a Torx-15 screwdriver. There are 2 screws on the side and 2 in the rear of the assembly. 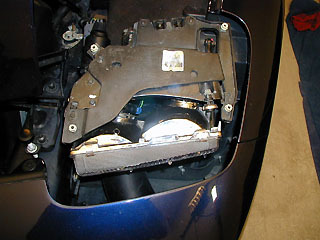 You will need to lower the headlight doors to get to the 2 rear screws as shown. Here is the stock headlamp with the door off. 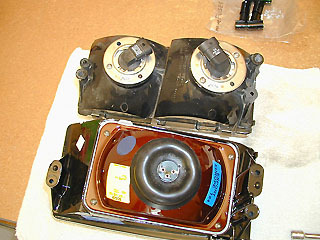 Unplug the stock connectors for the high and low beam and remove the cheap plastic headlamps. Look at the difference between the stock headlamp (on the top) and the e-code. Now is a good time to remove the stock wattage bulbs that the e-code ships with and replace them with the high wattage bulbs. Just carefully pull the rubber cover off and undo the clamp to replace the bulb. 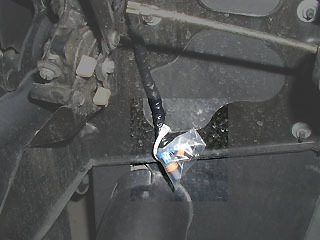 Now is a good time to tape-up the driver side connector that you unplugged from the headlight bulbs. You will not use the driver side connector in this installation. 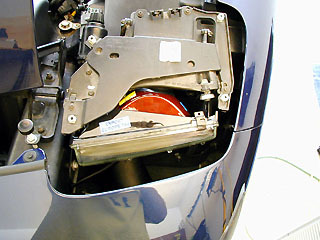 The passenger side connectors can now be cut. 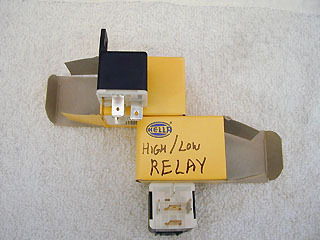 Make sure you leave yourself enough length to run to your relay mounting location. (I barely did!) You will not use the black ground wires - just the brown and green wires to switch the high and low relays. 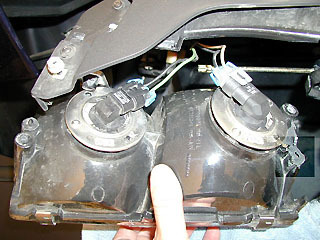 Run 2 separate 10 gauge wires from the driver side headlamp area to the passenger side headlamp area. Use your wire looming to cover the two wires. You will see where other wires have been run by the factory so just use a zip tie to secure the wire to one of the existing wires. 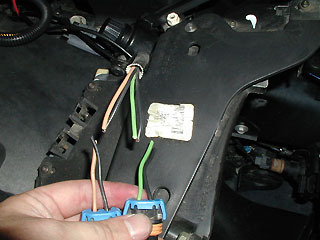 As shown here, you will need to splice into the wires that you just ran. If you are mounting the relays under the passenger side headlamp (like I did) then leave enough wire on the end to go from the splice to the rear of the new headlamp. 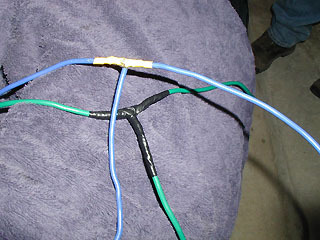 Strip away about a 3 inch piece of the insulation only on both of the wires and make your splice. Use solder, heat shrink tubing, and electrical tape to make a good connection. Here the ground point (Ground Distribution Cell 14) on the driver side. 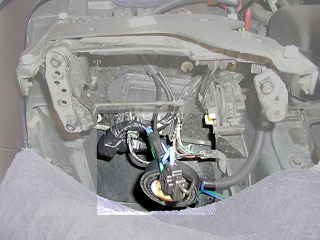 Run the black 10 gauge wire from here to the driver side headlamp area. 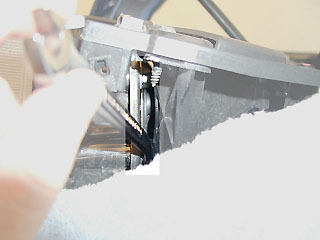 Remove the 10mm bolt and use a crimp-type ring-shaped terminal connector to secure the ground to the bolt. You may also want to solder the end, heat shrink it, and tape it.The other end will need to plug into the rear of the new e-code headlamp lens via the provided bulb adapter. 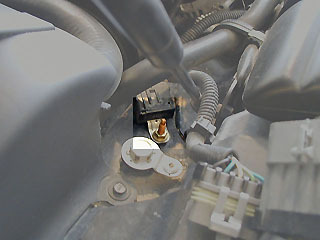 The passenger side ground point can be used to ground the low beam relay, high beam relay, and passenger side headlamp ground. Now it's time to run the 10 gauge power wire from the fuse box terminal to the relays that we will mount later. You will need to run separate power wires for each relay. 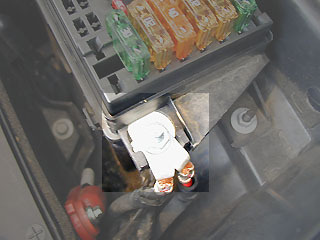 Install the 2 inline fuses on each of the power wires near the fuse box. Do not connect these until everything else has been done. I ran my power wires underneath the coolant tank. Use the wire looming and zip ties to protect and secure the wires. Attach the wires to the relays as shown in the wiring diagram. Here is an example of how the ends should look with the heatshrink tubing. Here are the relays. Use one for the high beam and one for the low beam. Connect the wires to them using the metal crimp-style terminal connectors provided in the kit and don't foget the relay terminal covers. These plastic covers will help protect the terminals. 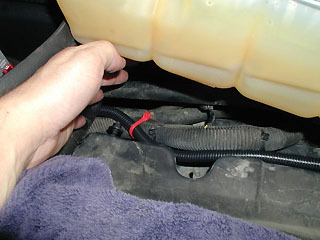 After taping the wiring to protect against water and debris, secure the relays using zip ties or whatever to a location underneath the passenger side headlamp which will not interfere with the door opening and closing. Now attach the 10 gauge power wires from the relays and ground points. There are 3 numbers on the bulb adapters - follow the wiring diagram to make sure you connect to the correct one. 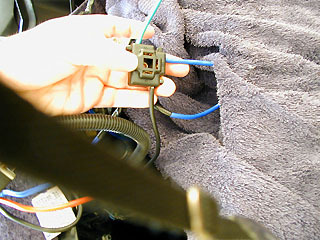 Tape the adapters to protect the wire connections as shown. This adapter is now ready to plug into the bulb on the new e-code headlamp. 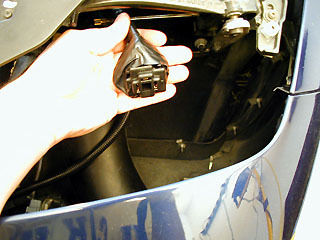 Now attach the power wires using a crimp-type ring-shaped terminal connector (like you used on the ground connections). Here is how it should look after everything is hidden connected. Here is the e-code installed. Next you should adjust your lights. Refer to the instructions in your service manual for aiming Export RH Rule headlights or visit the Daniel Stern Lighting website and look for the section on aiming your headlights. A garage wall or door works fine, as long as the ground in front of it that your car sits on is level. Find the center of the headlight and measure the distance to the ground. Mark a horizontal line on the surface (garage door or wall) using masking tape at the same distance from the ground. Place a small piece of tape in the center of the windshield, and another on the rear glass. Lining these up from behind the car, mark the center of the car on the aiming surface. Measure the distance between the center of both headlight lenses and use this to measure from the center point you just marked on the surface. Continue following the instructions below. 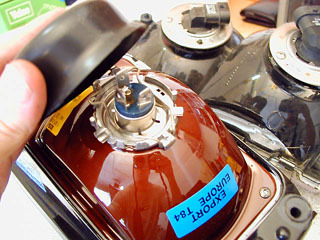 Remove the headlamp adjustment screw plug from the headlamp bezel. Reach under the headlamp bezel and push out the plug from behind. Turn ON the low beam lamps. Adjust the aim using the horizontal adjusting screw, to align the break point (3) of the high intensity zone to the headlamp vertical centerline (1), within the range of 38 mm (1.5 in) to the left (5) of the lamp vertical centerline (1), to 38 mm (1.5 in) to the right (4) of the lamp vertical centerline (1) on the aiming screen. Adjust the aim using the vertical adjusting screw, to align the upper edge of the beam horizontal cut off line 114 mm (4.5 in) below (7) the headlamp horizontal centerline (2), within the range of 76 mm (3 in) below (8) the lamp horizontal centerline (2), to 191 mm (7.5 in) below (6) the lamp horizontal centerline (2) on the aiming screen. Install the headlamp adjustment screw plug. Push to secure.